When faced with adversity, what story do you tell yourself? What natural reaction have you chosen over the years? If it’s anything but a positive reinforcement that you can get through it, you know you can change that, right? Like you, I have well-developed competencies and then some not-so-well-developed skills. Being resilient, or bouncing back from adversity, happens to be a strength for me and I’m examining why. The overarching reason is my faith that the Lord will get me through. That’s just a fact. In addition, I’m a little bit selfish in a good way: I don’t let stuff get to me any more than is reasonable. If I’m at odds with someone or an event, I consciously separate myself from the situation, look objectively at what I’m accountable for and what I can learn right now from it. I have experienced and recovered from one or more significant setbacks. I’ll jump right in here. In 2011, my vibrant, smart, world-in-her-hands, college senior daughter contracted a rare and life-threatening infection called Lemierre’s Syndrome. We are blessed that she is 100% recovered and loving her career in commercial real estate in Chicago. The season we dealt with this horrific disease, however, truly tested our resilience. As a Mom, I made it through by marshaling the forces of community prayer, seeking out and listening to knowledgeable advisors, taking initiative with the medical staff, focusing all those around our daughter on the positive and daily being grateful for her undeniable inner strength. I remain grateful every day. This was a discouraging, difficult life event. It would be easy to curl up in a ball and declare defeat, or victimhood. I chose to breathe, rise as an advocate and jump in when it was uncomfortable and I wasn’t the most equipped in the room. Both options are choices that you and I make. Every day. I reflect on setbacks, looking for opportunities that will yield benefits. As a 13-year entrepreneur, I can’t count my setbacks on one hand! Too-many-eggs-in-one-basket, not realizing my client connection wasn’t as strong as I believed, staying with a client too long for the wrong reason – I’m clearly imperfect in the pursuit of my passion for increasing the return of your employee investment. And bouncing back from adversity seen to be a theme for entrepreneurs. Focusing on the victories, not the losses. Believing in your own capability to accomplish good things. Catching yourself doing something right! Catching yourself and changing course if you’re beating yourself up about something. I discuss tough problems with friends and associates. Make this an easy one. Who are the 2-3 people who know you and love you anyway! Who is your greatest business mentor? Be vulnerable – give them your reality so they can provide valid, authentic advice and guidance. Are you handling some rejection? Are you stumped in a client relationship? Are you fuzzy on your best, next step? People love to be of service. Let them. The strongest among us are the first to ask for help and support and surround themselves with the wisdom of others. I bounce back quickly from tough days with optimism. Admittedly, I’m an optimist from birth. I know I have a finite amount of time on earth – why would I waste it being negative, down, complaining, miserable in a job or relationship. Fundamentally, I don’t get that. It’s a BIG reason I do the work I do with job matching – let’s get you in the right role, playing to your strengths! It’s important not to gloss over and keep things buried. The tricky part to handling a tough day is where it ends up in you. Do you see it as an isolated incident or do you bring it right into your heart and gut and store it next to the last bad day or piece of criticism you received, and next to the one from 2003 and then back in 1992? Hmm, how’s that working for you? You have to be able to bounce back up without being permanently scarred. Truly let it go! Own your mistakes so you can objectively grow from them. I engage in various activities weekly that provide personal renewal and recovery. Exercise. Starbucks. Journaling. Shopping. Meditation. Practicing gratitude. Getaways with your honey. What’s your personal renewal program? How do you reset your mind? How do you celebrate your accomplishments? 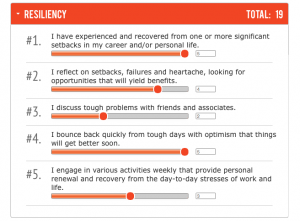 Think of when you have demonstrated resiliency? We all have difficult stories or chapters in our lives. Look at your life…how did you get to where you are today…when it was so ugly and scary back then? Be confident. Embrace healthy stress – there’s reasonable stress in nature when a caterpillar transforms into a butterfly. When you’re in a dark and difficult season, remember to shine your light. After all, you’ve done it before. I came across your weibtse/blog while recently working on post for my own blog on stepping out of my box. Wow! Then to read your recent message here about believing we have more than is required. For the first time in my life I truly believe those words. My husband at the age of 41 decided to enlist in the Army Reserves and was gone for 6 months of training. During this same time my oldest son also enlisted in the Navy. Immediately I became an Army Wife and Navy Mom and found myself with no option but to believe I had the strength to handle this seperation from two of the people that mean the most to me. My husbands desire to pursue a passion, has inspired me to do the same. It has shown my that I have an inner strength and so much more to offer, more than is required. THANK YOU for your inspiring messages.